According to studies conducted by the Centers for Disease Control, half of adults over the age of 30 suffer from some stage of periodontal disease. Despite the widespread prevalence of periodontal disease, there are warning signs patients in Encinitas and San Diego, CA, can watch for, and steps that can be take to helps safeguard gum health and prevent the disease. Patients with the disease often notice their gums appear more red than usual. Gum tissue should be pink, redness is a sign of inflammation. Soreness and bleeding when brushing and flossing are also common warning signs of inflammation. If you experience these symptoms, then see us right away for a diagnosis. If we address the problem in the gingivitis stage, we can reverse the problem. Once gum disease forms, there is no cure and we will instead need to manage the issue with regular treatment to prevent the advanced stages from developing. Periodontal disease has also been connected to certain long-term illnesses and medications as well, so knowing your medical history is crucial for understanding the state of your smile and preventing the onset of gum problems. Without treatment, gum disease enters an advanced stage known as periodontitis. 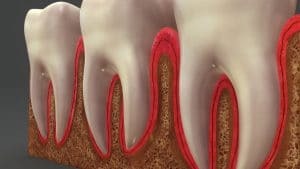 At this stage, the disease actually destroys the tissue connecting the teeth and gums, increasing the risk of loose teeth and adult tooth loss. If you experience changes to your gum tissue, such as pain or redness, then contact our team today. We have preventive treatments to help reduce the risk of the disease and safeguard your smile. If you recognize the symptoms we’ve discussed in today’s blog, then please give us a call. For more information, schedule a consultation with Dr. Kania by calling her periodontal office in Encinitas/San Diego, CA, at (760) 642-0711.